Haq's Musings: Orlando Shooting: Is US Gun Lobby Empowering Terrorists? Orlando Shooting: Is US Gun Lobby Empowering Terrorists? Yet another tragic mass shooting in America--this time in an Orlando gay night club with the heaviest recorded death toll in a mass shooting in American history. The culprit: Omar Mateen, a young AR-15 high-powered assault-rifle-wielding American-born Muslim reportedly self-radicalized remotely by ISIS via the Internet. "Over the last two decades, Canada has had eight mass shootings. Just so far this month, the United States has already had 20........Could it be, as Donald Trump suggests, that the peril comes from admitting Muslims? On the contrary, Canadians are safe despite having been far more hospitable to Muslim refugees: Canada has admitted more than 27,000 Syrian refugees since November, some 10 times the number the United States has.......More broadly, Canada’s population is 3.2 percent Muslim, while the United States is about 1 percent Muslim — yet Canada doesn’t have massacres like the one we just experienced at a gay nightclub in Orlando, Fla., or the one in December in San Bernardino, Calif. So perhaps the problem isn’t so much Muslims out of control but guns out of control." Although the Orlando shooting is the deadliest to date, it is one in top 5 mass shootings in America. The other four were carried out by non-Muslim shooters. One thing common among these mass shootings is that each of these involved the use of the AR-15 automatic assault rifle that was designed for use by the US military in Vietnam war to kill a large number of people quickly. 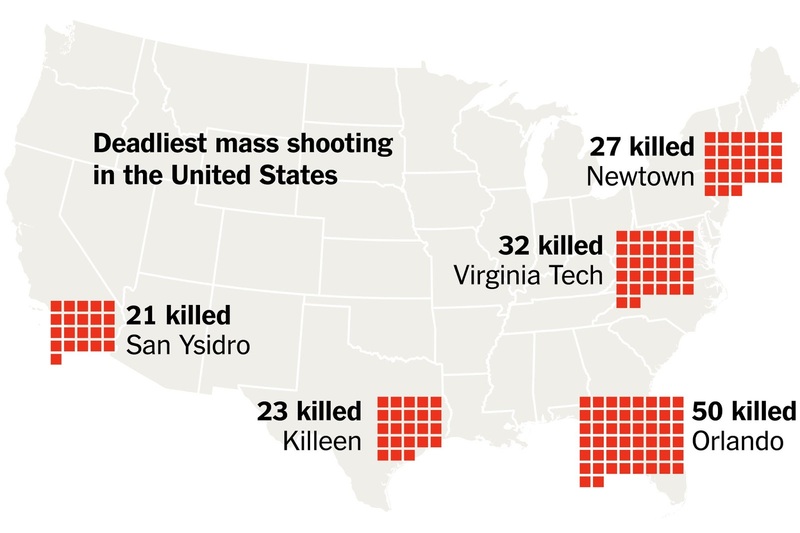 A third of the world's 15 deadliest mass shootings have occurred in the United States. 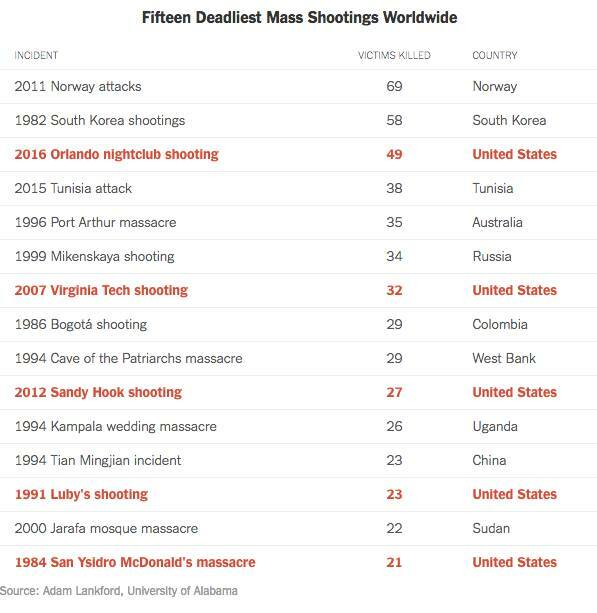 Orlando shooting with 49 dead ranks third in the world on this list. The world's deadliest mass shooting was carried out by a Norwegian named Anders Behring Breivik who is not a Muslim. To the contrary, Breivik was motivated by hatred of Muslims and Islam. It appears that the Norwegian white supremacist terror suspect Anders Behring Breivik's manifesto against the "Islamization of Western Europe" was heavily influenced by the kind of anti-Muslim rhetoric that is typical of the Nazi-loving Hindu Nationalists like late Madhav Sadashiv Golwalkar (1906-1973), and his present-day Sangh Parivar followers and sympathizers in the Bharatiya Janata Party (BJP) who currently rule India. This Hindutva rhetoric which infected Breivik has been spreading like a virus on the Internet, particularly on many of the well-known Islamophobic hate sites that have sprouted up in Europe and America in recent years. In fact, much of the Breivik manifesto is cut-and-pastes of anti-Muslim blog posts and columns that validated his worldview. After the Oregon mass shooting in October 2015, President Barack H. Obama finally asked the questions that many American Muslim victims of Islamophobia have been asking for a long time: How many Americans have been killed through terrorist attacks over the last decade? And how many Americans have died in gun violence. 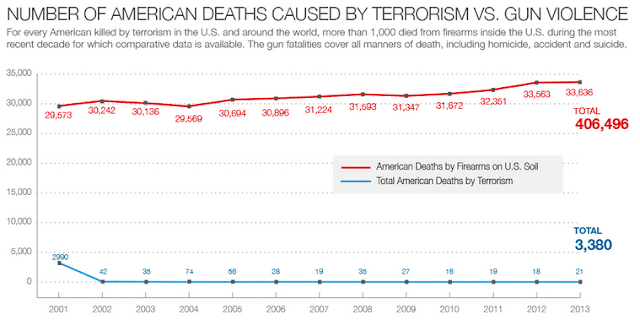 The US Centers for Disease Control (CDC) has reported 316,545 people deaths by firearms on U.S. soil from 2004 to 2013. This figure is 1000 times higher than the total deaths of 313 Americans by terrorism at home and abroad in the same period. Aided by the gun lobby and its conservative supporters, anti-terrorism and Islamophobia have emerged as major new US industries in the wake of the terrorist attacks of 911. Anti-terror industry is worth trillions of dollars. Islamophobia industry, estimated at $200 million, reinforces and promotes the fear of Islam and Muslims for its own gains. With their entrenched vested interests, the growth of these industries has served to distract attention from the 1000X bigger problem of gun violence. The National Rife Association, also know as the gun lobby, has taken full advantage of the situation by buying out the majority of US Congress which opposes even most modest gun safety regulations. In addition to distracting Americans' attention from growing gun violence, increased spending on Islamophobia is having a significant impact on Americans' perception of Muslim Americans. Results differ by political party, with the majority of Republicans holding negative views of both Arab-Americans and Muslims. Democrats gave Arab-Americans a 30 percent unfavorable rating and Muslim-Americans a 33 percent unfavorable rating, while Republicans gave Arab-Americans a 54 percent unfavorable rating and Muslim-Americans a 63 percent unfavorable rating, according to public opinion survey conducted by Zogby Analytics. I'm glad to see President Obama finally highlighting the issue of gun violence as the biggest public safety issue in America, far bigger than the issue of terrorism. I hope the President will continue to use his bully pulpit to highlight the problem of gun violence and persuade Americans to not vote for those to US Congress who oppose gun control legislation. I also hope that other individuals, organizations and the mass media will support Mr. Obama's campaign to bring about a sea change in American thinking about gun rights. Mohammad Malik: "I reported #Orlando shooter Omar Mateen to #FBI. #Trump is wrong that #Muslims don’t do our part." I know this firsthand: I was the one who told the FBI about Omar Mateen. as news reports this week have made clear, Omar did have a dark outlook on life. Partly, he was upset at what he saw as racism in the United States – against Muslims and others. When he worked as a security guard at the St. Lucie County Courthouse, he told me visitors often made nasty or bigoted remarks to him about Islam. He overheard people saying ugly things about African Americans, too. Since Sept. 11, I’ve thought the only way to answer Islamophobia was to be polite and kind; the best way to counter all the negativity people were seeing on TV about Islam was by showing them the opposite. I urged Omar to volunteer and help people in need – Muslim or otherwise (charity is a pillar of Islam). He agreed, but was always very worked up about this injustice. All Muslims are not terrorists but all terrorists are Muslim!! Rakesh: "All Muslims are not terrorists but all terrorists are Muslim!!" It's true if you define acts of violence committed only by Muslims as "terrorism" AND exclude violence by non-Muslims from the definition as is often the case these days. For example, more than 90% of mass shootings are done by white men but these perpetrators are not called terrorists and their murder and mayhem not defined as terrorism. Overwhelmingly, those who have committed terrorist attacks in the United States and Europe aren’t Muslims. Let’s give that a moment to sink in. Pankaj Mishara to Rafia Zakaria: " We, and by that I mean “the intelligentsia,” made a catastrophic mistake after 9/11 when we located the roots of terror in Islam, saying that there is something peculiar in their political tradition that explains an eruption of violence. That perspective looked past the mixed history of terrorism, and we now see that regardless of whether it is in Burma or Thailand or India, militancy and terrorism emerge out of a confluence of socio-economic factors. It is a sign of desperation and despair. This idea that it belongs to Islam in particular is a very dangerous idea; it was made mainstream and it was legitimated not just by the far right who are in charge of policy today (and have been engaging in this puerile debate), but also by the liberal intelligentsia. Francis Fukuyama, for instance, said there is something intrinsic about Islam which is just not compatible with modernity. Then there is Salman Rushdie and even Martin Amis, talking about mass deportation as part of a thought experiment that he offered to a journalist. In sum, all sorts of mainstream figures were advancing this Islamophobic discourse in very holistic and dangerous ways, and in the guise of teaching Islam or understanding Islam or helping the Muslim moderates. This is why we are where we are today." Russian politician Alexander Torshin, standing next to then-Russian prime minister Vladimir Putin, attends a ceremony at the Kremlin in 2011. Torshin is a lifetime member of the National Rifle Association, and says he met Donald Trump through the group in 2015. A prominent Kremlin-linked Russian politician has methodically cultivated ties with leaders of the National Rifle Association, and documented efforts in real time over six years to leverage those connections and gain access deeper into American politics, NPR has learned. Russian politician Alexander Torshin claimed his ties to the National Rifle Association provided him access to Donald Trump — and the opportunity to serve as a foreign election observer in the United States during the 2012 election. Torshin is a prolific Twitter user, logging nearly 150,000 tweets, mostly in Russian, since his account was created in 2011. Previously obscured by language and by sheer volume of tweets, Torshin has written numerous times about his connections with the NRA, of which he's a known paid lifetime member. NPR has translated a selection of those posts that document Torshin's relationship to the group. These revelations come amid news that the FBI is investigating whether Torshin, the deputy governor of the Bank of Russia, illegally funneled money to the National Rifle Association to assist the Trump campaign in 2016, McClatchy reported in January. Torshin's use of NRA connections to open doors, and his 2015 claim to know Trump through the organization, raise new questions about the group's connections with Russian officials — at a time when the organization is being roundly criticized by its opponents, and at times the president himself, for being a factor in American gun violence. On his verified Twitter account, Torshin talked about how he knew Donald Trump through the NRA, citing a connection at the 2015 convention. Responding to a tweet about comedian Larry David accusing Trump of being a racist, Torshin said he knew the businessman through the NRA, and defended him.